While fuel costs may have been a dominant theme across all airlines, their strategy and ability to offset those costs vary. This is likely tor remain a key focus for analysts and may be a driver of relative performance among the airlines in 3Q. Let's explore this in more detail with Viewer. Delta scored near the top of airlines on an absolute basis with an Amenity Score of 55 (scale -100 to +100). 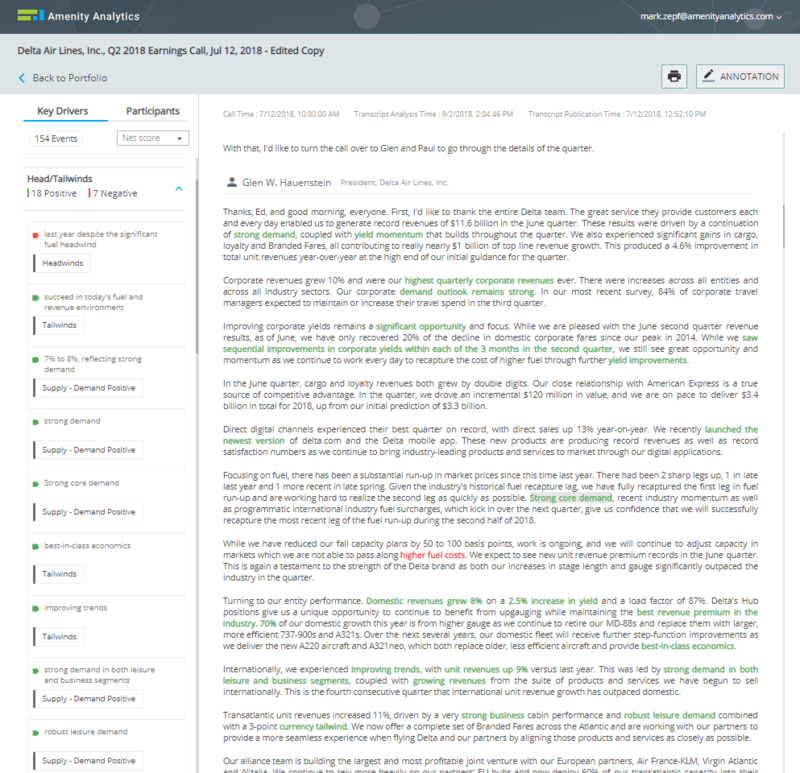 With the Company View serving as a backdrop we use Viewer to dive into the transcript itself. What is Driving the Unfavorable Cost-Price Mix, and What is Delta Doing to Offset? Using the Key Drivers on the left to dive into Cost-Price, we quickly see a clustering of negative highlights related to higher fuel costs. When we see the highlights in the context of the document, it takes us to a paragraph that highlights some clear trends: higher fuel costs are weighing on earnings, despite a strong and improving revenue outlook. "We are raising our full year revenue guide to 7% to 8%, reflecting strong demand, pricing momentum and record unit revenue premiums." "Unit cost growth rates are down sequentially for the third consecutive quarter." "Pricing is certainly a function of cost. And with higher fuel prices, you're going to expect to see ticket prices go up as well. Our pricing currently is up about 4% on a year-over-year basis, so I think it's at a good level." How does that compare to the competition? We analyzed these same Cost-Price dynamics in the other Airlines earnings calls. Pricing was mentioned sparingly, with more airlines leaning on operating cost reductions. 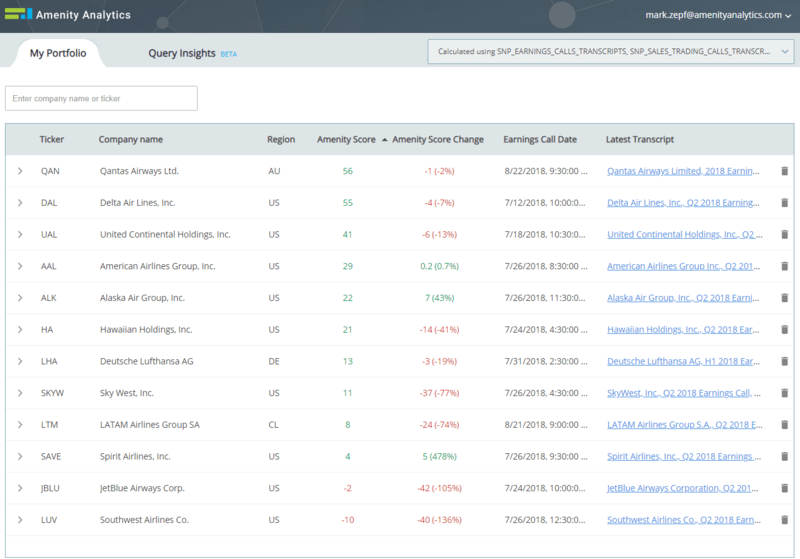 Note that the two companies most vocal on price (Delta and United Continental) scored near the top of the group overall. Perhaps the strong flexing their muscles? Separately, Southwest lives up to its reputation for more aggressive fuel hedging programs. "Higher fuel prices that we expect will be more than offset by improved revenue and continued cost discipline"
"Strong performance from our revenue management team and Gemini, our new yield revenue management system, combined with an improving pricing environment, allowed us to drive higher domestic PRASM even in tough industry conditions." "We're taking aggressive actions in the immediate term, including lowering our 2018 capacity growth, reducing our non fuel expenses and deferring future aircraft deliveries and CapEx." "With hedging losses well behind us, and a strong hedge in place for this year as well as next, we are well positioned to manage through fuel price headwinds." "The right thing for us to do is make these adjustments, including the capacity cuts in the fourth quarter." "It's clear that we have higher cost and we need to be focused on taking actions that help us recover these higher costs." "Better operational performance was a large driver of this improvement and resulted in lower passenger re-accommodation expense and lower crew disruption expense per ASM as well as improved labor productivity and efficiency, which helped to partially offset the impact of higher wage rates." "We're seeing sequential improvement in non fuel unit costs as expected." What drove the Tailwinds uptick among the Amenity Key Drivers? 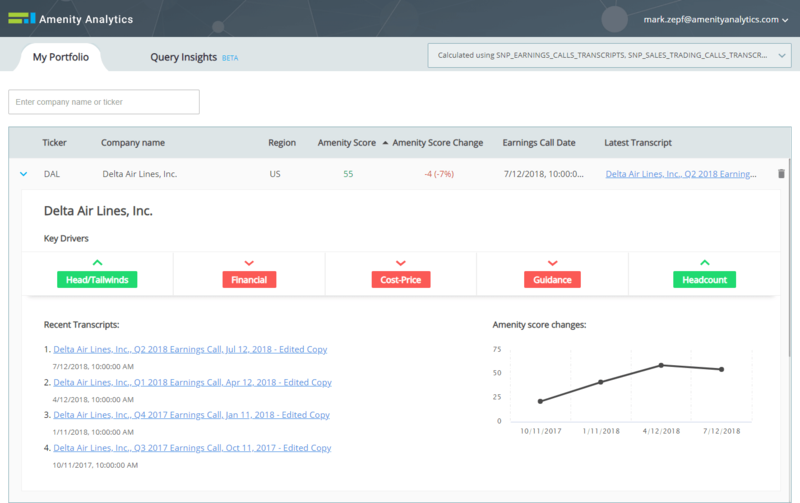 Amenity Viewer analyzes Delta's previous earnings call transcripts to set the stage for Delta's upcoming earnings call. 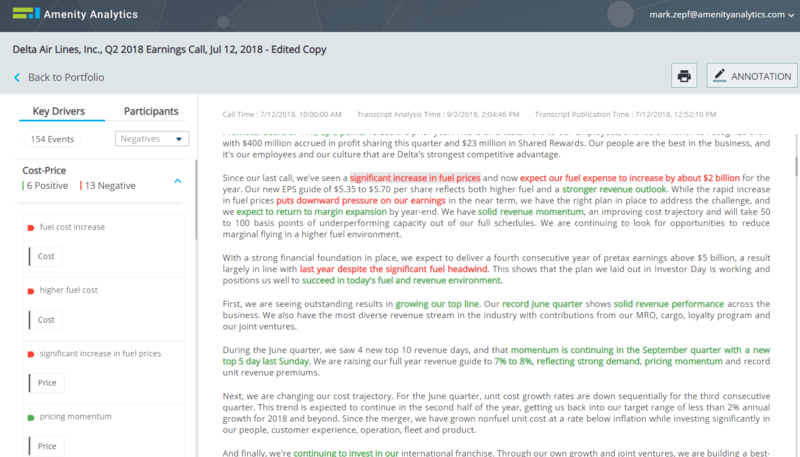 We explore two key themes that dominated 2Q earnings call for Delta and the industry as a whole: Fuel costs and Demand.